Now I do have lots of memories and can go back to being 3 years old. I can remember a doodlebug going over and nanna putting me under the bed; I can remember the big house and the man there I think he was Cherry Garrard's brother or some such; I think I did meet Cherry he showed me a big cupboard he said they kept the family secrets in; he seemed more outgoing and not as posh as the other man; I cant remember a woman, which is strange. Nanna used to often bring a man home to stay over because he was too drunk to drive - he had a car that smelt beautiful - a Jag or a Wolsey - she would say to granddad "he has test flights tomorrow that's why he is drinking too much" then I never saw him anymore, I think he crashed. He was at Dehavillands. Mrs Coates died in her bed at Lamer Cottage and granddad had to get a ladder he called down to nanna "She's gone with the bible in her hands". That was very dramatic for me. Mr Garrard had a black road built to his mansion (big house) and used to drive past in what I think was a Rover. My grandma had her licence and drove an Austin 7, she reckoned I knew how to drive and I used to steer it and change the gears. I can remember a big quarry on the left towards Gustard Woods we could go there to swim. I loved riding my bike - had a accident outside Knights - went headfirst and broke my arm. Anther time I biked out to I think Bernard Shaw's place and hung around. He had a performance of Twelfth Night on (it was night time) - I was about 12/13 then. The gardens were all lit up. I was a precocious child and very naughty. I know now I just wanted to be normal and have a mum and dad - the other kids used to tease me. So, to any one I was naughty to - I am sorry. I started school at 4 yrs old (not positive) and we had to lie down in the afternoon for a rest. My first day I wanted none of that so ran away, somebody came with me, cant remember who. They found us in a wheat bin on a farm nearby. School was not bad. Teachers I can remember: Mr Price, Miss Crawley and Miss Ireland. I can remember the Catholics had to make a file and leave the classroom when our bible classes were on. I had a terrible fear of them - having to leave and all that. I can remember Fridays - "fish pie" oh it was awful. and having to stand up for free dinners - that was awful too. Mr Housden was always at dinners and would read the menu out. I remember ration tickets, but we never wanted - my dad used to visit with black market things. I thought it was a market for black people! I can remember a Sally Baker and Stella Swallow (who I email now), the Cunnington's - Jane-somebody. Once I went to senior school - Miss Slow and Mr Griffith and I am sure a Miss Yashnac - she used to teach Scottish dancing. We had a girl who used to wear the kilt - Ena Clarke. Miss Slow took us to a Choir Festival and we sang "Where ere you walk"; but we didn't win. I forgot to mention Janet Cobb she was a special person. We left Lamer Cottages in the early fifties and moved to 17 Brewhouse Hill. I joined the Congregational Church and the last year, 1954, we put a play on. I will send photo of myself and other participants. I used to go to Devils Dyke, and play in the Churchyard. I remember when the Queen visited for the coronation. We were all on the main St outside the churchyard. I remember the Gaff twins and Knights the hairdressers - I had cut my plaits off and had to go and get tidied up - I was a horror! There was a female doctor called Mare-Williams and Cunnington's - a sort of toy shop - my nanna used to clean it, or the dentists above. Any way - that's my memories. I left in late 1954 to live in London. They say its sad to see the changes - but its happened here Mandurah my home town in west Australia, was a sleepy little coastal village in 1980 now its a bustling plastic city full of plastic people and plastic cards, we moved to a 1,200 pop. Sleepy inland town, I wonder how long????. Have found the photo--now going left to right 1st left--cant remember, 2nd left I think Jane somebody, 3rd--myself, centre I think she was sister of 1st left, 4th can't remember, 5th can't remember, 6th Maureen Squires. Another quick memory - Brewhouse Hill had a huge underground---whatever--my nanna said it was a old war shelter--it was going up the hill - it most likely ran under Helmets Ltd. My grandfather worked at Helmets on the pulp machine. I used to bike ride with a Pat White, and Mrs Dellar lived next door to us in Brewhouse Hill. Also the senior school had air raid Shelters on the grounds that we did sports on. Did Jack Hyde have any memory's of being the Hyde that I remember - he must be 82 now, thou my other half is 78 and he has a good memory. 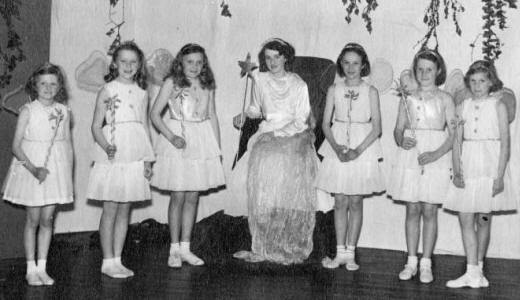 The photo on your website of St Helens girls 1955 has Stella Swallow in it and Maureen Squires. Stella and I are email friends now. If there is anyone around Wheathampstead who would like an email pal it would be great. My name was Maureen Chubb and I am 67 now.